No, this isn't China. 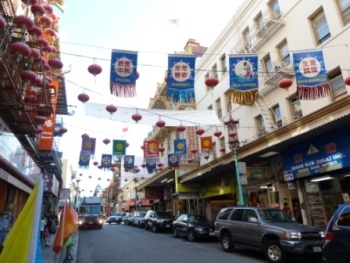 It's Chinatown in San Francisco - and a great visit to kick off our trip to China. 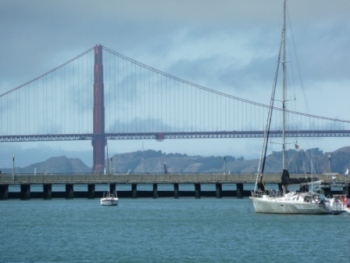 When the fog lifted, the red Golden Gate Bridge was a great backdrop for the bay. 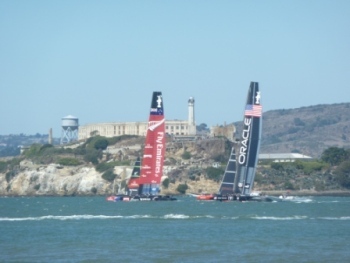 The excitement of the America's Cup race passing in front of Alcatraz Island . 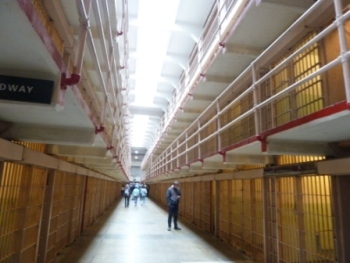 . . was a stark contrast to the depressing interior of the prison. 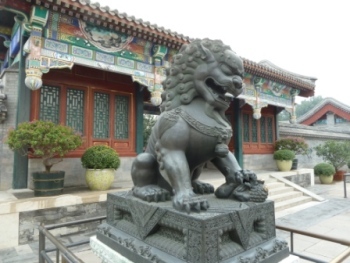 Giant lions guarded the entrance to the Summer Palace in Beijing, China. 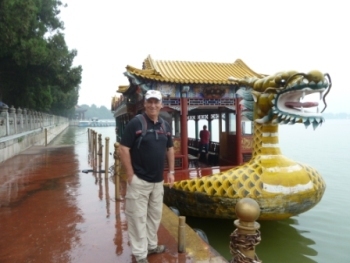 After strolling through the gardens and decorated covered walkways, we took a ferry boat across the man-made lake that the Emperors had built. 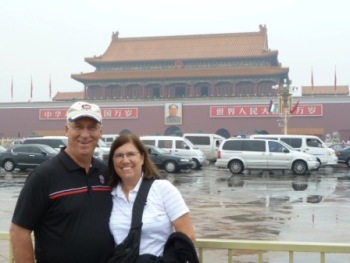 Tian'anmen Square stretched on and on. 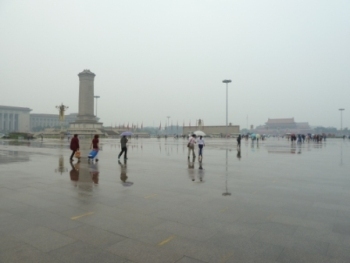 This is only one part of the largest public square in the world, that is the home of the glass coffin holding the remains of Chairman Mao and the site of the infamous riots. 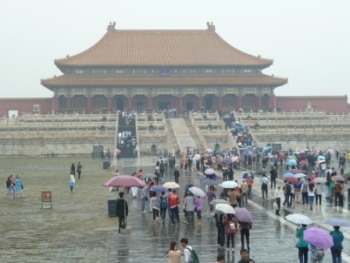 The far end of the square was the entrance to the Forbidden City, the home of the Chinese Emperors. From this balcony (above his portrait) Chairman Mao gave many of his speeches. The spaces inside the Forbidden City were huge and each time we thought we had reached the end, we passed onto another large area with another palace building. 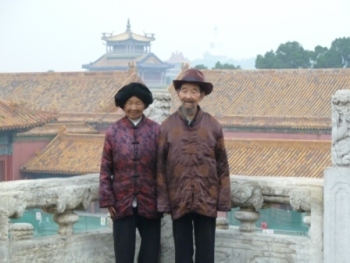 Tourists from all over China came to see this national treasure, like this 85 year old couple dressed in their best from the provence of Hunnan. 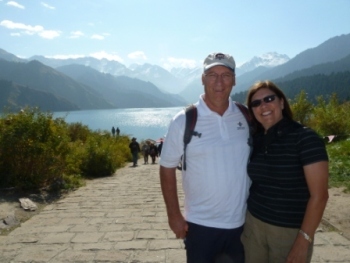 Their son said they had flown for the first time to see their life-long dream. 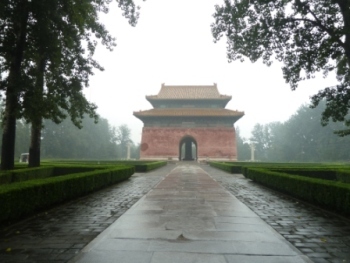 The morning started out with rain showers, but stopped when we arrived at the Sacred Way of the Ming Tombs. 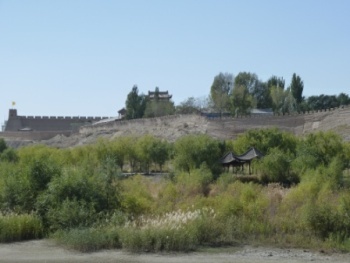 This huge cemetery dates from the 1300s and is the burial grounds for 13 Ming Dynasty Emperors. 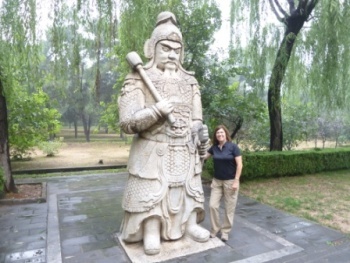 As we walked the mile and a half path through part of the grounds, we passed statues of men and animals that "guarded" the still unexcavated tombs. Another check off the bucket list. 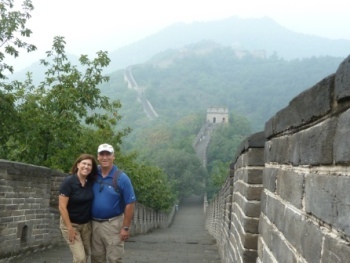 We finally have walked on the Great Wall! Our guide took us to a relatively untouristy part with many watch towers, the Mutianyu section, located about 2 hours from downtown Beijing. 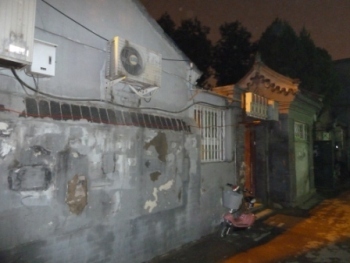 That evening, after a rickshaw ride around the historic Hutong District, we stopped at this house for dinner with a local family. 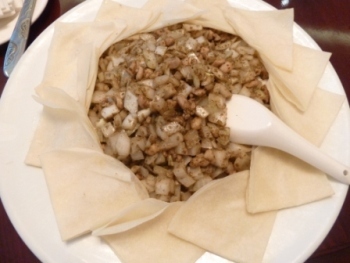 Inside, we were treated to one of the best meals we had enjoyed in Beijing. Our group - Larry, Robert, Don, Vicki, our guide Julie, Dave, Jackie and Paul - was served at least a dozen different delicious dishes by the lady of the house who prepared everything in the small kitchen in the background. The beautiful sky above Heavenly Lake near Urumqi in the Xinjiang Provence is about as remote as it gets in China. We were between Kazakhstan and Mongolia with glaciers behind us on the mountains. 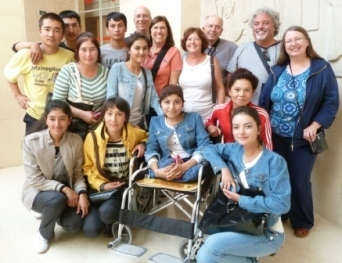 In this part of the world, Americans are rarely seen and we were a huge tourist attraction. People were always asking to have their picture taken with us. 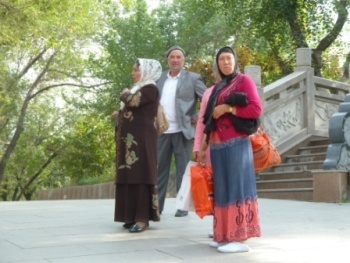 Many local people are Uygar people from the nearby "stans" - Kazakhstan, Kyrgyzstan, Afghanistan, Tajikistan, and Pakistan which all border this provence. We saw several groups of 8-10 police officers dressed in riot gear strolling through the parks and standing on sidewalks. 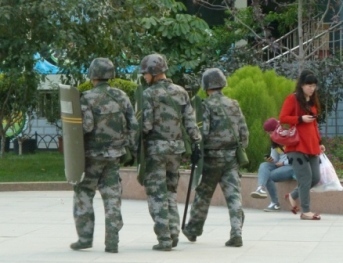 This area of China is a boiling pot of minority protesters wanting representation in the government controlled in Beijing by the majority Han people. Our idea of losing weight in China is not working out. We have a large lazy-Susan full of dishes at each meal like this delicious cumin mutton and mushrooms dish served with lotus leaf pancakes. 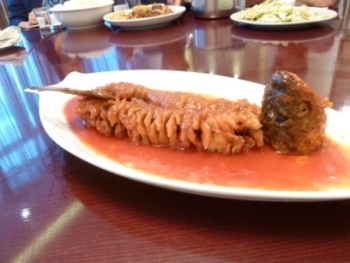 . . or this artistically presented spiral cut carp complete with head and tail served in a sweet and sour sauce. YUM! 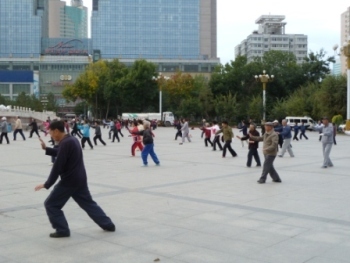 In the morning, groups of people met to practice sword twirling, stick fighting, ballroom dancing and Tai Chi in the People's Square. 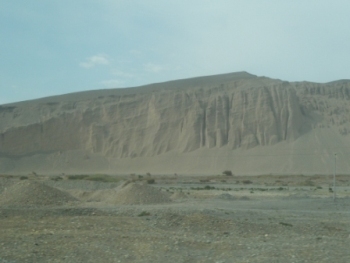 Our drive through the Gobi Desert started out with chilly 44° weather in Urumqi at 5,000 ft.. We descended past a large lake that is saltier than the Dead Sea and lined with salt mounds when the North wind began to blow. 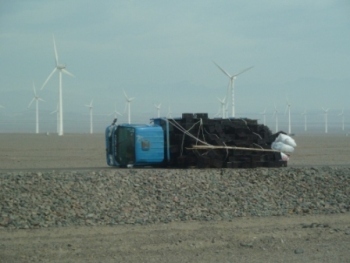 We passed miles of windmills that had all been turned off due to the high winds. 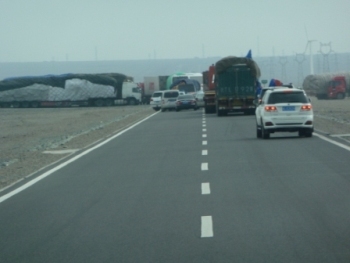 By the time we passed the 3rd overturned truck, we followed the lead of all the other cars & trucks and pulled off the road to put the wind at our rear. We were told that if rocks hit and broke our windows (like a car we passed), we were supposed to lie on the minibus floor. We saw one man get out of his truck and was blown off the road. 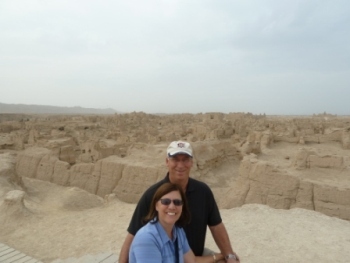 After about 15 frightening minutes the wind subsided and we continued on to Turpan, the second lowest place in the world after the Dead Sea, and a temperature of 88° when we arrived. 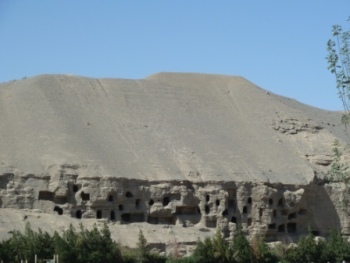 Near Turpan are the ruins of the Ancient City of Jiaohe - a city 2000 years old, built of mud bricks and still preserved since less than one inch of rain falls here. 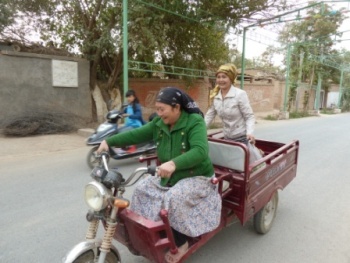 Most people own and drive practical "tricycles" instead of cars. 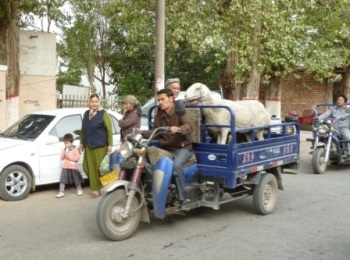 They are used to haul people, animals and just about anything else. 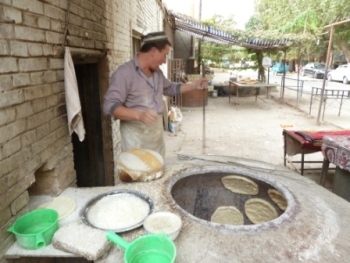 We enjoyed watching a baker and his wife prepare the local bread in his round oven. The bread is wonderful with a small crunch on the outside and soft inside, just like good French bread. 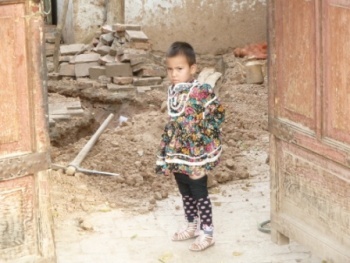 This little girl stood watching us from her front door. 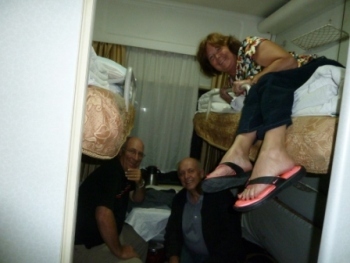 Our 7 1/2 hour mostly sleepless overnight train ride from Turpan to Dunhuang was in a small "first class" compartment for 4. 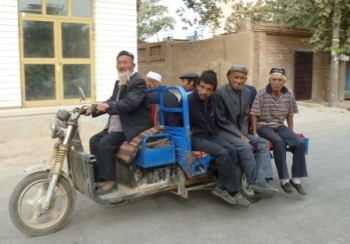 We still had it better than the other people who had to sit in chairs the entire trip, or the travelers in camel caravans who used to use this route on the old Silk Road. 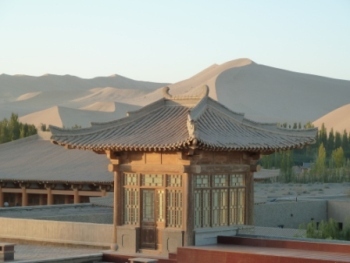 After another two hour ride in a private 22 passenger bus on the Massage Road (named for the constant washboard effect as we drove), the 8 of us were delighted to see the gorgeous Silk Road Hotel in Dunhuang with a rooftop view of the desert dunes behind. 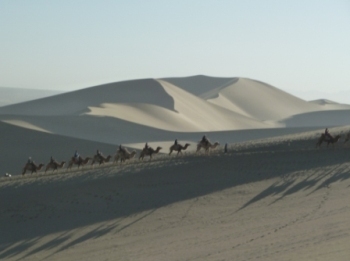 The next day we were part of a 1,000 camel caravan that rode for 2 hours in the Singing Sand Dunes with jaw-dropping Salvador Dali-like landscapes surrounding us. 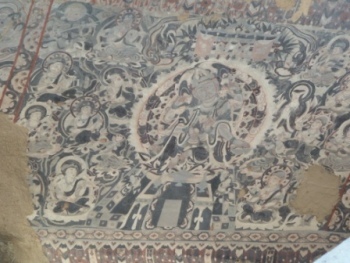 The World Heritage site, Mogao Grottoes, were caves dug by Buddhist monks over 1,200 years ago. Inside we saw unretouched paintings that have survived mostly intact due to the dry climate. 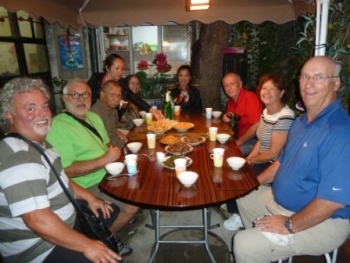 We almost regretted asking our guide to take us to a restaurant that served "local foods". 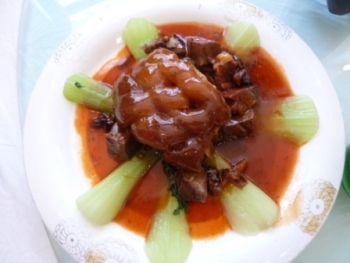 The first dish that came was beef cheeks served with bok choy in a sweet & sour sauce. Actually, it wasn't bad. 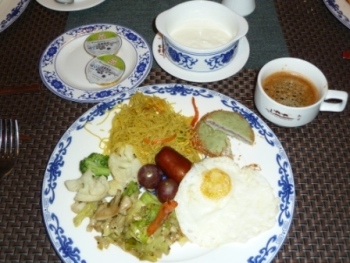 A typical breakfast on our trip has been a combination of American and Chinese foods. Along with our fried eggs, fresh fruit and sausage; we had a variety of noodles, stir fried vegetables, wonderful local yogurt and green bean cakes edged with sesame seeds and filled with jam. 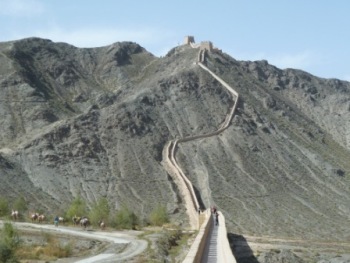 The western end of the Great Wall was totally different than the eastern Beijing wall. 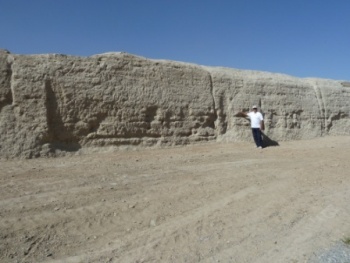 Here the wall was thinner and shorter (only about 10 feet), just enough to keep out the Mongol horses. 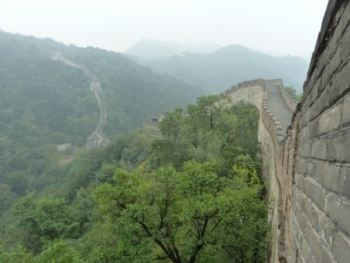 But along the wall were small guard towers that were used to send smoke signals to warn of attacks. The large Jaiyuguan fort was the home of the General in charge of the tail end of the wall. Inside the fort we enjoyed a Cultural show that included knife twirling, gymnasts and traditional dancing. 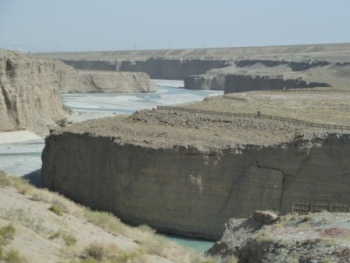 The wall extended both directions from the fort and finally ended on one side up in the mountains and on the other side in the Discussion Lai River.